A disease that’s worse when you’re happy. The unemployed Pierogi. And Wimbledon is back! You hear so many incredible, fascinating stories on NPR’s This American Life that it really takes something extraordinary to stand out. While catching up on my TAL podcasts last weekend, I literally almost pulled over when I heard this one. In the episode titled “Held Hostage” we meet a man named Matt Frerking, who has a disease that sounds impossibly cruel. It’s a type of temporary paralysis called narcolepsy with cataplexy. When it strikes Matt, he can’t move his head, his arms, or legs until the attack passes a few minutes, or hours later. What triggers the attack in some patients, including Frerking? Strong positive emotions. Meaning, when Frerking is the happiest, the attacks are the worst. So he had a terrible attack at his brother’s wedding. Petting a puppy causes an attack. His grandchild’s second birthday party? Complete paralysis for a while. I can’t imagine many things worse than this for a person to endure, emotionally. All the joy that life brings, hugging his wife, his kids, feeling a wave of happy emotions over his body, are what causes him the most discomfort. Frerking said he’s basically trying to live life as a robot, to prevent the disease from striking. It’s truly an amazing story; give it a listen, it’s only about 10 minutes long. Here’s the link; click on the live stream button, and then fast-forward to the 44:50 mark. **Ah, another week, another funny mascot story. 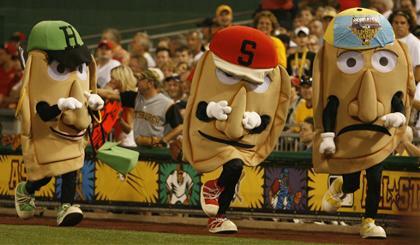 The Pittsburgh Pirates, always known for their acumen in player personnel and management (they’ve had 18 straight losing seasons) have now fired one of the guys who plays the pierogi mascot during a mid-game promotion. What was his offense, he was too full of himself? No, turns out Andrew Kurtz, 24, had criticized the team on his Facebook page for giving the manager, John Russell, a contract extension. **Finally, I say this: World Cup, Shmerld Cup. 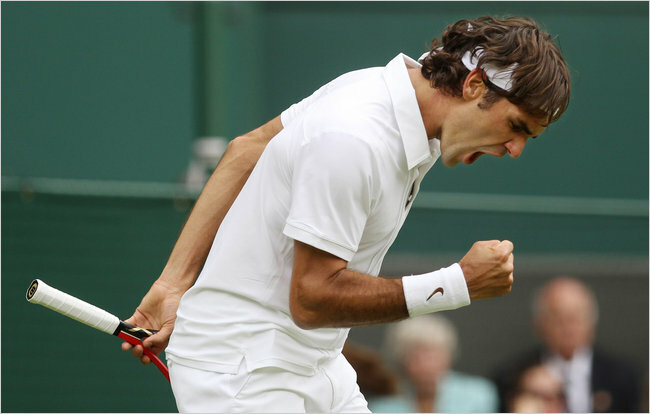 Wimbledon is here, and I am a happy man. My favorite event of the sports year, Wimbledon gives me so many reasons to love it every year. The history. The drama. The strawberries and cream. And this year, the Queen is even coming for a visit! First time in 33 years Her Majesty will watch live on Centre Court. Monday was a scary day for Roger Federer, but he survived in five (Honestly, Fed losing in the first round to that shlub would’ve been one of the 2-3 greatest upsets in men’s tennis history). Check out my daily Wimbledon blog for the News-Journal here.